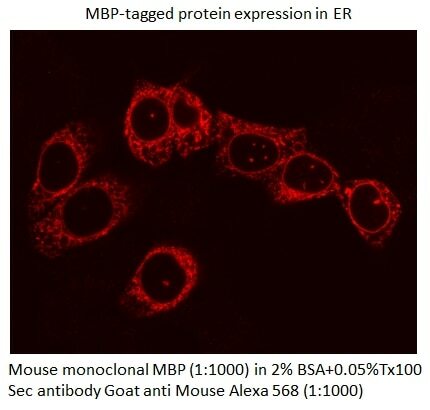 IF result of MBP tag antibody (66003-1-Ig, 1:1,000) with MBP-Tagged protein.Courtesy of Neeraj Tiwari, PhD, Yale School of Medicine, Yale University. 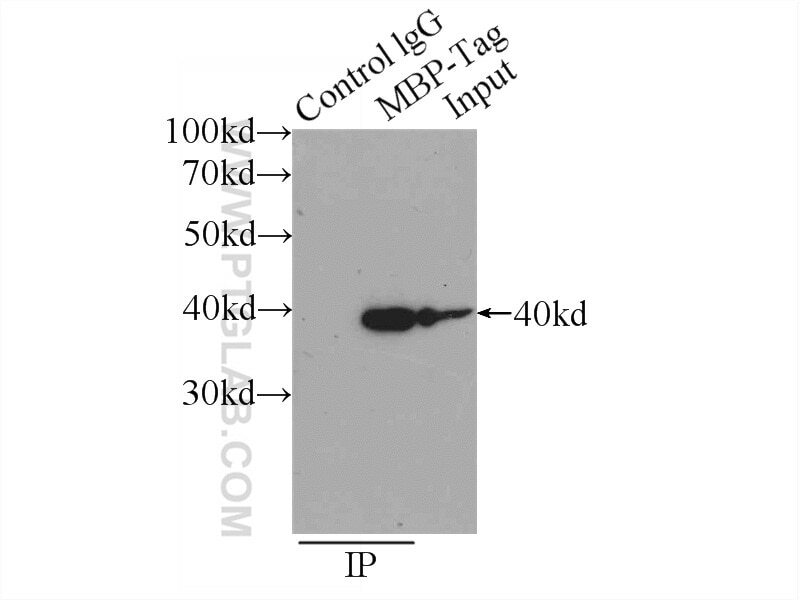 IP Result of anti-MBP tag (IP:66003-1-Ig, 5ug; Detection:66003-1-Ig 1:20000) with Recombinant protein protein lysate 800ug. Protein tags are protein or peptide sequences located either on the C- or N- terminal of the target protein, which facilitates one or several of the following characteristics: solubility, detection, purification, localization and expression. Maltose binding protein(MBP) is the 370 amino acid product of the E.coli mal E gene. MBP is a useful affinity tag that can increase the expression level and solubility of the resulting tagged protein. The MBP tag also promotes proper folding of the attached protein. Plasmid vectors have been constructed utilizing the MBP domain that allow the synthesis of high levels of MBP-fusion proteins that can be purified in a one step procedure by affinity chromatography cross linked amylose resin. Once bound to amylose, the MBP protein can then be separated from the target protein by cleavage by coagulation Factor Xa at a specific four residue site. Alternatively, the intact fusion protein can be specifically eluted from the resin by the addition of excess free maltose. Subsequent to elution, MBP fusion protein can be visualized either by Western blot analysis or immunoprecipitation using antibodies specific for the MBP-tag. An antibody to MBP can also be used to isolate or detect expression of the protein. A New Member of the TBC1D15 Family from Chiloscyllium plagiosum: Rab GTPase-Activating Protein Based on Rab7 as a Substrate. MMP-9 Facilitates Hepatitis B Virus Replication through Binding with IFNAR1 to Repress IFN/JAK/STAT Signaling. SCFAtPP2-B11 modulates ABA signaling by facilitating SnRK2.3 degradation in Arabidopsis thaliana. Unspliced XBP1 Confers VSMC Homeostasis and Prevents Aortic Aneurysm Formation via FoxO4 Interaction. Characterization of Ferredoxin-Dependent Biliverdin Reductase PCYA1 Reveals the Dual Function in Retrograde Bilin Biosynthesis and Interaction With Light-Dependent Protochlorophyllide Oxidoreductase LPOR in Chlamydomonas reinhardtii. The extended C-terminal region of influenza C nucleoprotein is important for nuclear import and RNP activity.